The following post is part of our Treasure Hunting series. Find out more about our Treasure Hunting series here. To help you in your biblical understanding of money and possessions, we've outlined 10 money principles (that are more about your heart than your money). Each principle comes complete with scripture references to study. In Luke 12:13-21, Jesus doesn’t call the rich man who bought extra storage units built bigger barns wicked. Jesus calls him a fool. And Jesus diagnoses that his problem is that he wasn’t rich towards God. Being rich towards God is not a moral act we do. It’s a way of being. It’s an attitude and a posture where our hearts see God, consider what He’s doing in the world, and gladly move our money, possessions and energy in His direction. Being rich towards God is being wise with our money so we aren’t constantly in financial chaos. Being rich towards God is guarding ourselves from the traps of selfishness, greed and materialism. Being rich towards God is generosity with our possessions to help others have their needs met. Being rich towards God is leveraging our money, homes and energy toward mission as we help others take next steps toward Jesus. In all of these aspects, Jesus is our perfect substitute and example. None of us is clean when it comes to financial sin. I’m not. You’re not. We are a lot like the rich fool in Luke 12. We are excessively rich toward ourselves. We spend on our needs and wants without hesitation; on both basic necessities and on lavish luxuries. We are greedy. We take and accumulate for ourselves with little concern for other’s needs. We consistently fall into the trap that money and possessions can deliver the good life to us, and so we constantly hunger for more. But in the cross, Jesus became our greed. He became our selfishness. He became our materialism and our money idolatry in the cross (2 Cor. 5:21). Jesus paid our financial sin debt so that we could be free from the punishment we deserve for our stinginess. Jesus succeeded in every way the rich man (and we) failed. 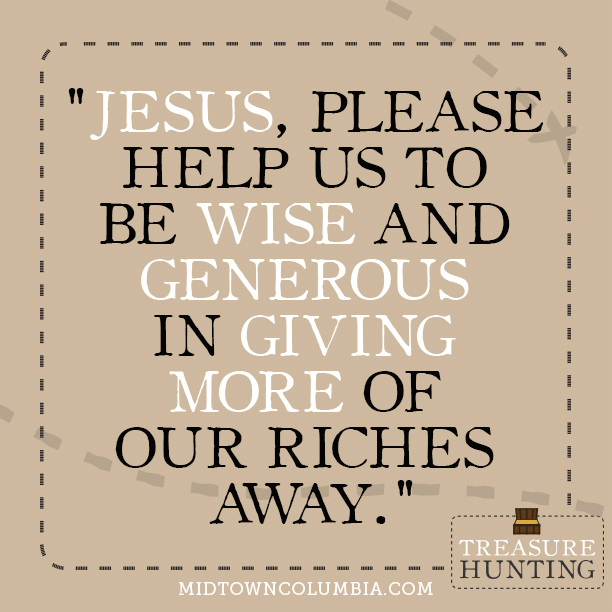 Rather than store up all of His wealth for Himself, Jesus gave it away. Rather than be rich towards Himself, Jesus was incredibly rich toward God. In all of history, He is the single richest-toward-God human being who has ever lived. Jesus never failed to see God or consider what God’s doing in the world. In His every waking moment, Jesus turned His life in the direction of God’s mission. He sacrificed His health, His riches in heaven, His material comfort, His high status, His power and position and He literally gave Himself up for us. And now in Jesus, we can become rich toward God like He is. We can live sacrificial and generous lives like He did. We can grow to become God’s kids who look like He does. Jesus, help us to be wise and generous as we give more of our riches away. Amen.